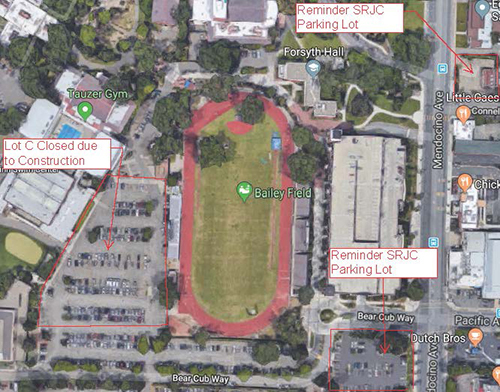 April 10, 2019, Santa Rosa - Beginning Monday 4/15/19 Lot C will be closed for construction for the remainder of the Spring semester. Permit Holders for Lot C will be able to park in temporary staff spaces to the south of Lot C without being ticketed (this only applies to Lot C permit holders). There is a new parking lot at McConnell Ave and Mendocino Ave, across from the Little Caesars, as well as a lot next to Santa Rosa High School. Students can still park for free at the 7th street parking garage. Day passes for this are available at the Student Life and Engagement desk, Bertolini First Floor.